Applications for 2012 are now open. 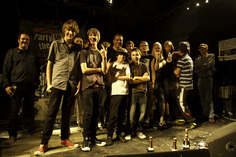 You can now apply for the 2012 Okehampton Battle of the Bands. Our application system is now live, and you can apply on-line or download an application form and send it in. Anyone wishing to enter, please read the rules, regs, terms and conditions. Then proceed to the application form. If the applicant or any band members are under 18, we will need you to fill in an off-line application form as we we will need signed parental consent. This year we have decided to request a small, £50 deposit from the bands once they have been accepted. We have decided to do this due to issues arising by bands not turning up on the night of their heat, leaving us with an expectant crowd and no band to play! The deposit will be returned to you on the night of your heat.